Just home after spending 14 days on a PG safari in Namibia. The trip was divided into three parts. First hunting on a big cattle/ low fence game farm bordering Etosha National Park. Then spend two days on photo safari in Etosha, and hunt the rest of the time at Johanns place Tualuka Lodge a bit down the road. After settling in the first day and done the rifle check, Johann came asking if any of us was interesting going hunting PAC lion the same afternoon! A cow has been killed by lions from the park and the farm manager wanted it taken out. One of our guys jumped in, and off they went. A bit later that night they came back with a dead young male lion on the cruiser. This one was shot by Johann, but the hunter had shot at another one who had gone into the bushes. Darkness made them hit for camp. Next morning they went after the other lion and found it dead close by. I was after mountain zebra on this farm, and after two days of tracking, following, climbing and crawling, I got a good shot at eighy yards. The zebra went 30 yards and toppled over, dead. It did get a bit exiting there, couse the zebra was shot not far from the park border, and it was getting dark very fast. A blood fresh zebra and the wind blowing toward the park and the lions, wanted us to get out of there as fast as possible. The tracker went for the cruiser, but never came back. We had to go look for him and found him stuck with a front wheel in a warty hole. Got it loose, got back to the zebra, no lions there, got him loaded up and went home. The other guys was also doing fine, and after three days we went to Johanns place the Tualuka Lodge. This place is like magic, built into and partly on top of granite boulders by a koppi, next to the dry Huab River. Next for me was a black wildebeest, who had to be hunted on a high fence farm close by, but with a fenced area of 3200 hectares, I had no problems with that. It took me the day, but late afternoon I got within 180 yards of an old bull and gave him a low lung shot. He was technically dead, but needed another two to settle down. Then it was springbok time. I had three on my whish list and after many hours of spot and stalk I had them. They where all three angling a bit, therefore the exit wounds in the belly on two of them. Time for a break in the hunting and Etosha National Park. Becouse of lots of rain in Namibia, there where water everywhere in the veldt, so waterholes was usually empty of game. Still we did see a lot of animals and took many pictures. What really amazed me was the enormous and pan cake flat Etosha Pan, wich covers an area of 4731 square kilometers! Here we became witness to a small drama when a python killed a jackal and slowly made it dissapear down his throat. This took place only 23 meters from the roadside. Unfortnately the grass was so high, that the pictures I took was useless. Bak to the lodge and my last animal, the kudu! For two days we stalked the grey ghost without sucess, but late the second day as dusk fell, the eagle eyed trackers spotted a nice bull on a grass flat. Off the cruiser in a blink, ran to find a place for a clear shot, up with the sticks, rifle on, safety off, crosshears on shoulder, and the deafening sound of a CLICK! In the heat of the rush I had forgot to chamber a round! Fortunately, he came clear a few seconds later in a small opening and this short glimps was enough. Johann, Tjokki and Jonas put in a lot of good work for me to bag this one! Two more days left of a fantastic hunt, and I just wanted to relax in camp and enjoy the hospitality of Johanns family, and the beautifull surroundings. So next morning boots and hat on and off to the woods. We soon spotted gemsbok on a broad flat beween two koppis, and after a sucessfull stalk from mopani bush to mopani bush, I was able to give him a bullet behind the shoulder. 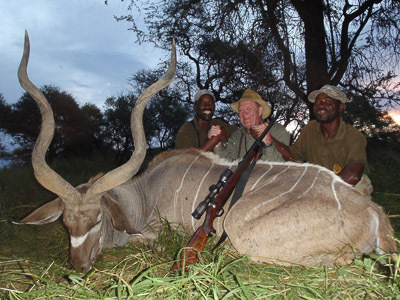 Among us four hunters we did take 26 animals, including the four free gemsbok´s, and a rabid kudu cow. Johann Veldsman runs a superb outfit, with demanding but great terrain, a terrific lodge, and perhaps the best of all, include his guests as members of his family at the lodge. That gave this safari a very special thouch. We did not bring measuring tape with us, but all animals taken was good ones, some my even reach silver or gold medals after measuring? Namibia is by far the cleanest and most tidy country I have ever seen, and I have seen a few! Rifle used was the Ruger Hawkeye in 375 Ruger, loaded with 270 grn TSX. Scope was the new Zeiss Duralyt in 2-8×42. A great thanks to Johann and Vera who set up an unforgettable safari for us frozen Vikings in the sunny and friendly Namibia!